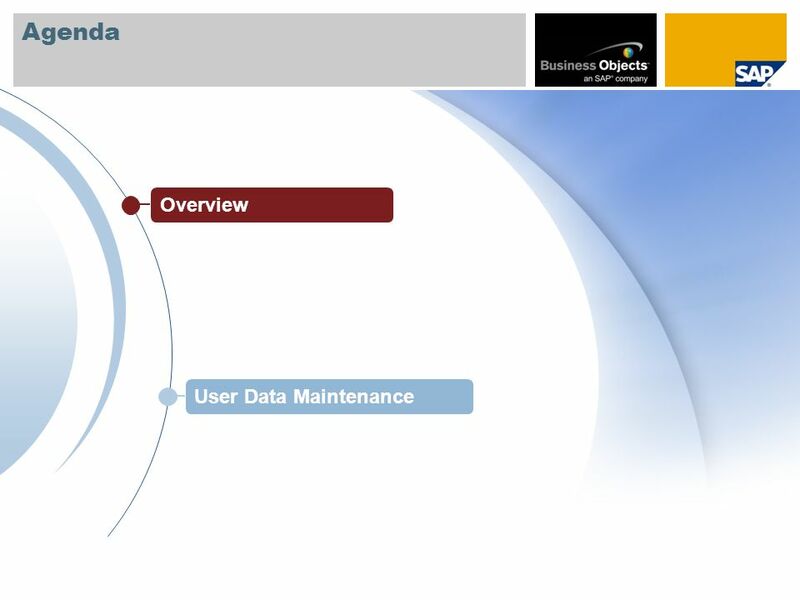 User Data Maintenance Learning Map SAP Support Portal. 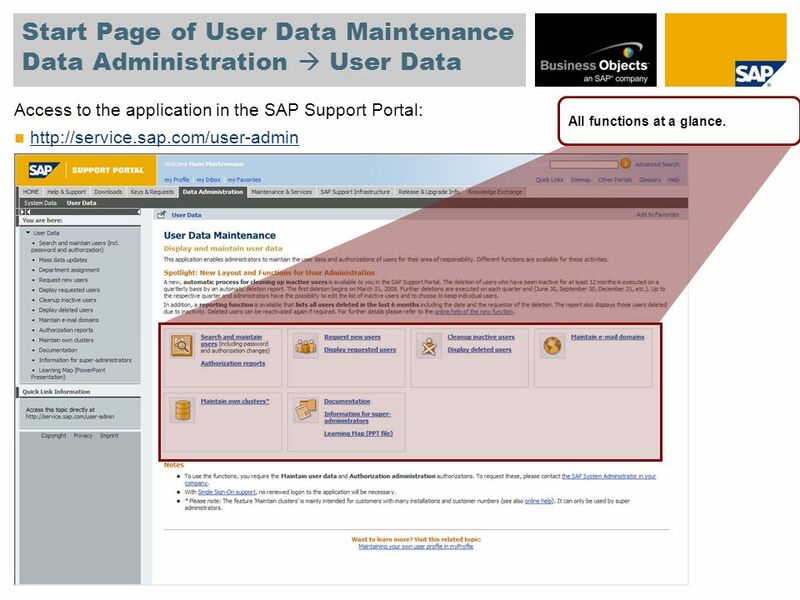 3 Start Page of User Data Maintenance Data Administration  User Data Access to the application in the SAP Support Portal: http://service.sap.com/user-admin All functions at a glance. 6 Click here to search and maintain users. 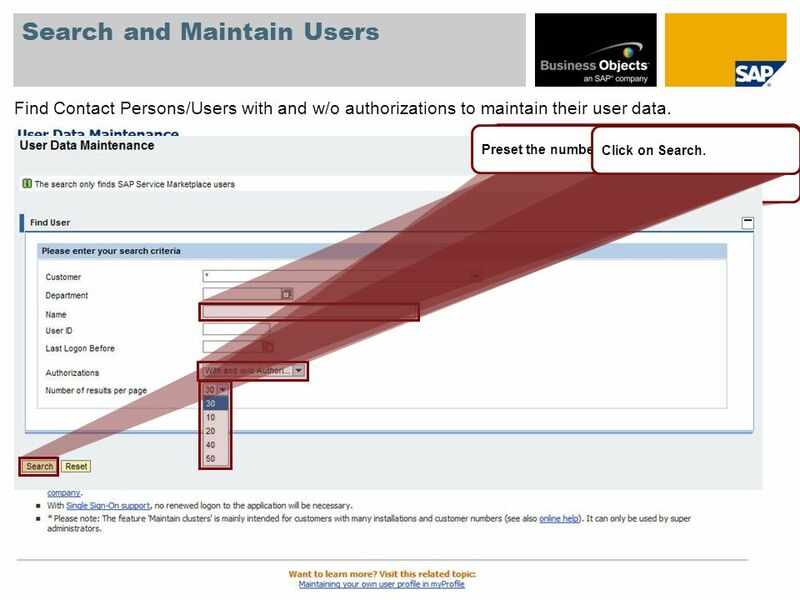 Search and Maintain Users Find Contact Persons/Users with and w/o authorizations to maintain their user data. Entry of a wildcard possible (e.g. A*)Display users w/o authorizations.Preset the number of results per page.Click on Search. 7 Search and Maintain Users Features in the result list: sort, search, filter, download and simultaneous deleting of several users. Sort functions ascending / descending.Search and filter functions via wildcard (*). To delete multiple users, select them by clicking these preceding buttons and… … click on Delete selected users. 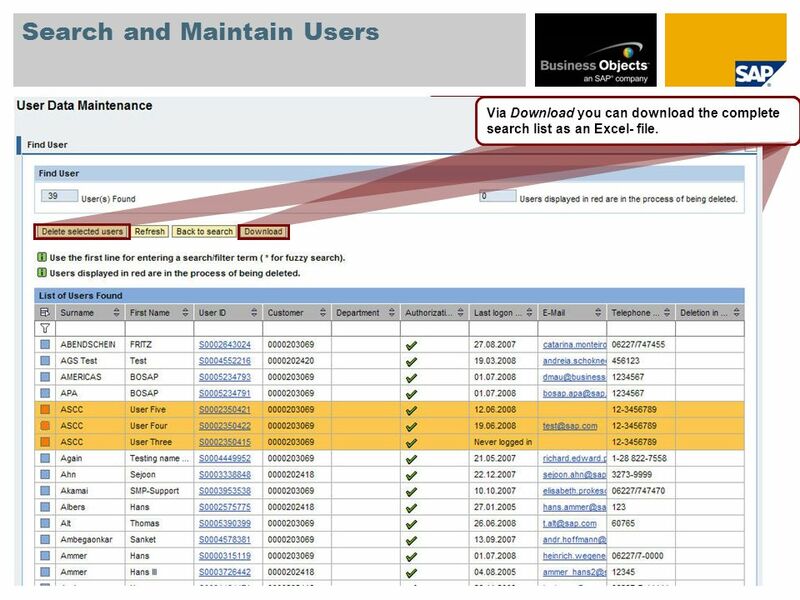 Via Download you can download the complete search list as an Excel- file. 8 Search and Maintain Users Maintain the user profile, password and authorizations. Click on the user ID to access the user profile.Click on Edit to maintain the user profile.Change the password using this tab.Maintain the authorizations here. Display the user history (requested by, request date and last logon date) here. 9 Request New Users Fill out the user data. Before requesting the new user you have to assign the authorizations. Otherwise the user will not be created. 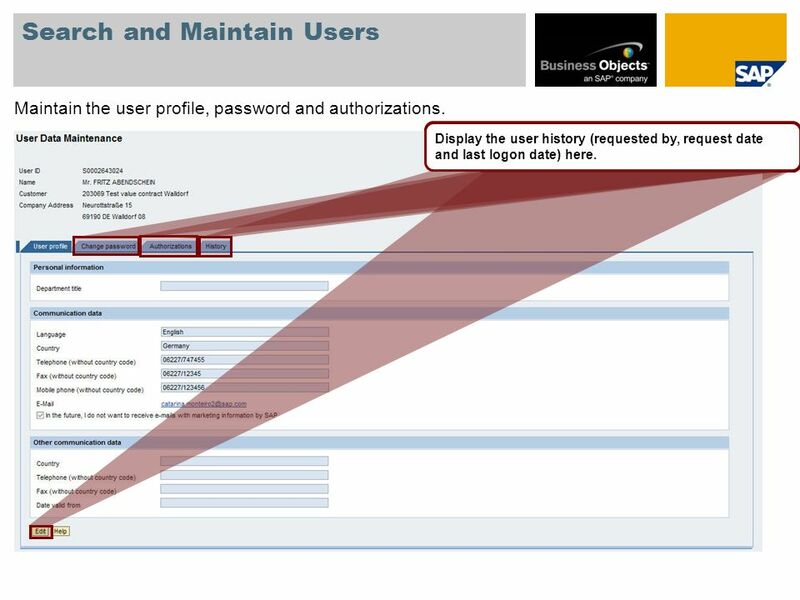 To copy the authorization profile of an already existing user, enter the S- user ID and click on Copy. You can see now the copied authorizations here. By clicking here you can display and thus adjust the authorizations objects. Proceed via Done. Saving the data creates the new user in approx. 2 hours with the copied authorizations. To request new users click here. 10 To display requested users click here. List of Requested Users The list of the requested users contains only users who have not logged on to the system yet. Use the first line for searching.Access a user profile via its user ID. 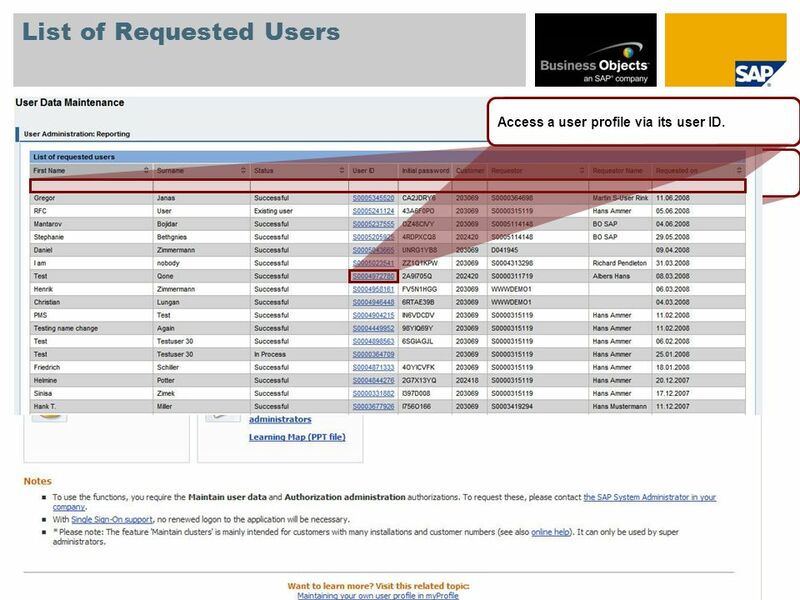 11 Authorization Reports of Users Select authorization objects (optional). Specification on which levels the authorization objects are valid. Restrict selection by customer and/ or installation number (optional). Click on Search.You have access to the search filters here.Access the user profile by clicking the user ID.You can download the list here. 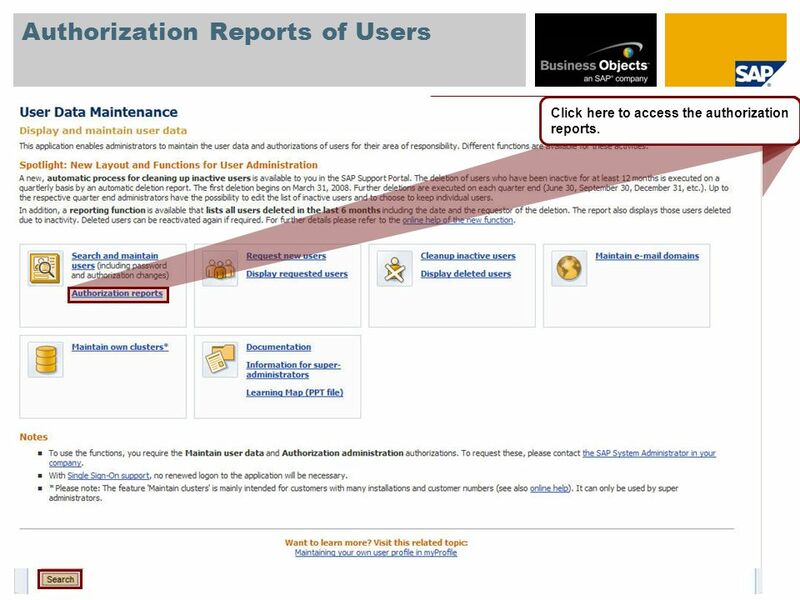 Click here to access the authorization reports. 12 Cleanup Inactive Users Click here to cleanup inactive users. You can see here the list of users who have been inactive for 12 month. 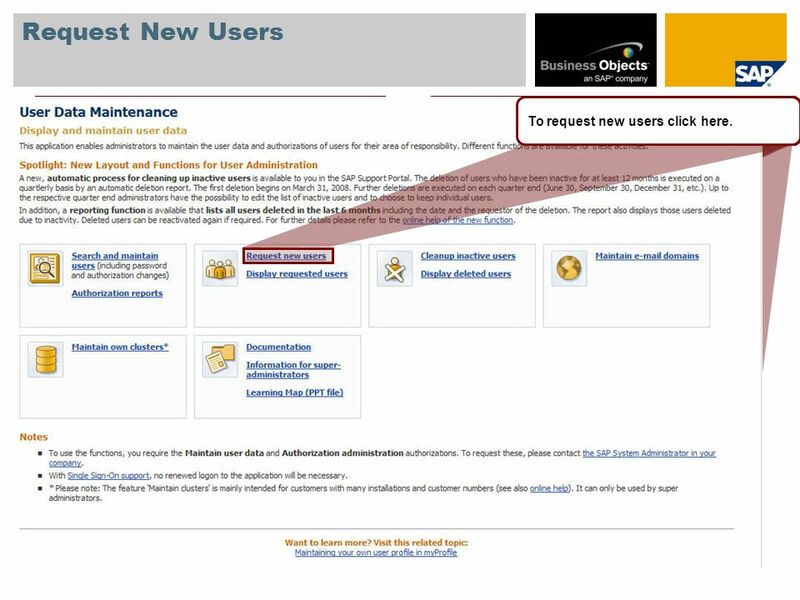 These users have not logged on to SAP Service Marketplace and have not sent any messages to SAP via the SAP Solution Manager during this time. To set the action status for all users click at this dropdown list. You can choose now between Delete User ID and Keep User ID. 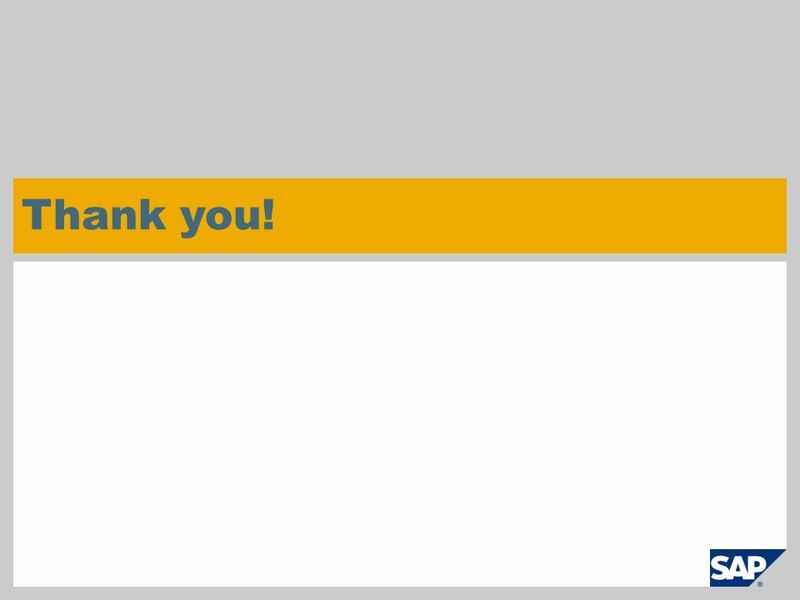 To specify an action for just one user, click at the according action entry in the list. By clicking Save your changes will be saved and the users with the action status Delete User ID will be deleted at the end of the quarter if you do not update the list. By clicking Save and Delete your changes will be saved and the users with the action status Delete User ID will be deleted immediately! 13 Display Deleted Users Click here to display already deleted users. 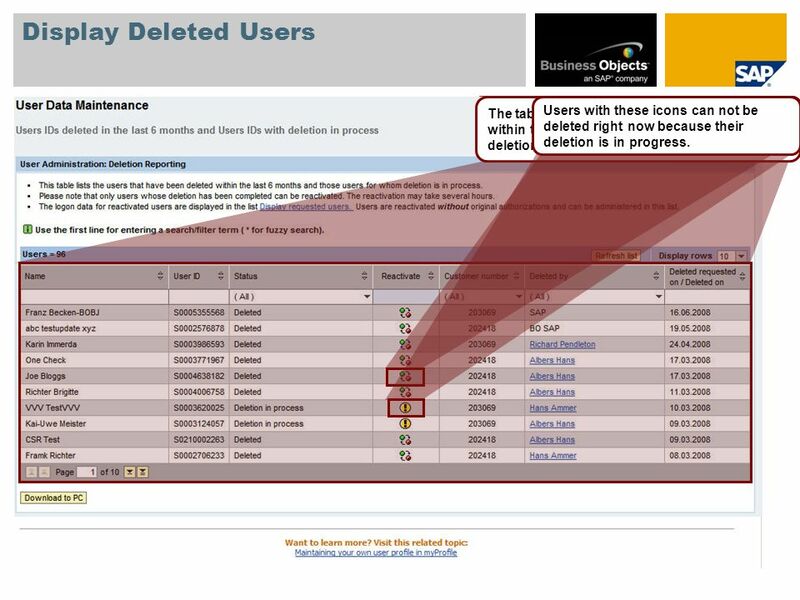 The table lists the users that have been deleted within the last 6 months and those for whom deletion is in progress. To reactivate a user click on this reactivation button. Users with these icons can not be deleted right now because their deletion is in progress. 14 Click here to maintain e-mail domains. Maintain E-mail Domains Type in the domain name and …… save the new domain.To delete old domains mark them and …… click on Delete domain(s). 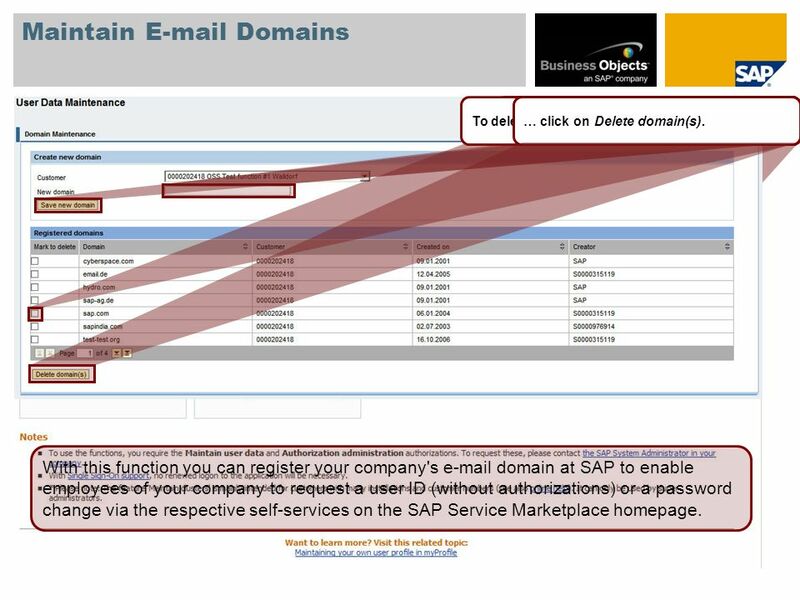 With this function you can register your company's e-mail domain at SAP to enable employees of your company to request a user ID (without authorizations) or a password change via the respective self-services on the SAP Service Marketplace homepage. 15 Maintain Own Cluster Create and maintain own clusters (value ranges) – only relevant for customers with many installations and debitors. Enter a cluster name and …… click on Create.Click on the cluster name to assign values.Define the value range of the cluster. After the value range of the cluster is saved, it can be used to assign authorizations. A deletion of the cluster is only possible if there are no users assigned to the cluster. 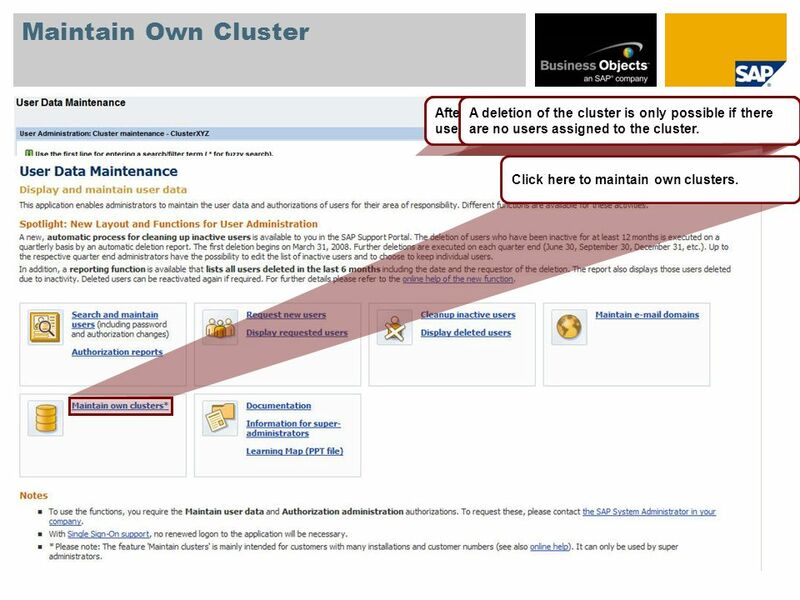 Click here to maintain own clusters. 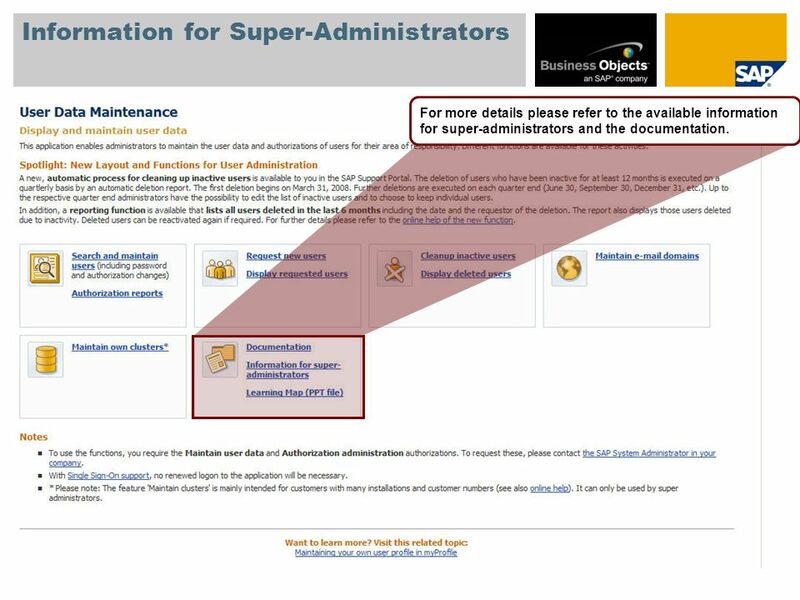 16 Information for Super-Administrators For more details please refer to the available information for super-administrators and the documentation. 17 © SAP 2008 / Page 17 Thank you! 18 Copyright 2008 SAP AG All rights reserved No part of this publication may be reproduced or transmitted in any form or for any purpose without the express permission of SAP AG. The information contained herein may be changed without prior notice. Some software products marketed by SAP AG and its distributors contain proprietary software components of other software vendors. SAP, R/3, xApps, xApp, SAP NetWeaver, Duet, SAP Business ByDesign, ByDesign, PartnerEdge and other SAP products and services mentioned herein as well as their respective logos are trademarks or registered trademarks of SAP AG in Germany and in several other countries all over the world. All other product and service names mentioned and associated logos displayed are the trademarks of their respective companies. Data contained in this document serves informational purposes only. National product specifications may vary. The information in this document is proprietary to SAP. 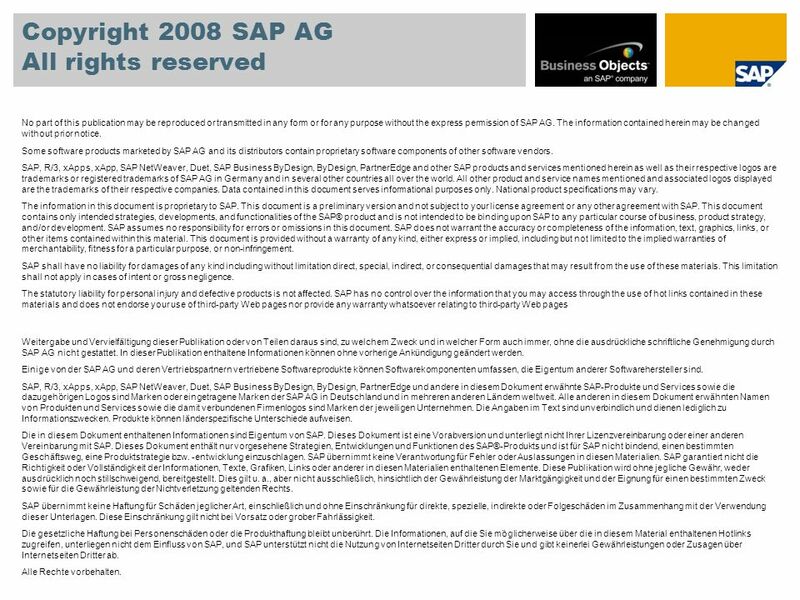 This document is a preliminary version and not subject to your license agreement or any other agreement with SAP. This document contains only intended strategies, developments, and functionalities of the SAP® product and is not intended to be binding upon SAP to any particular course of business, product strategy, and/or development. 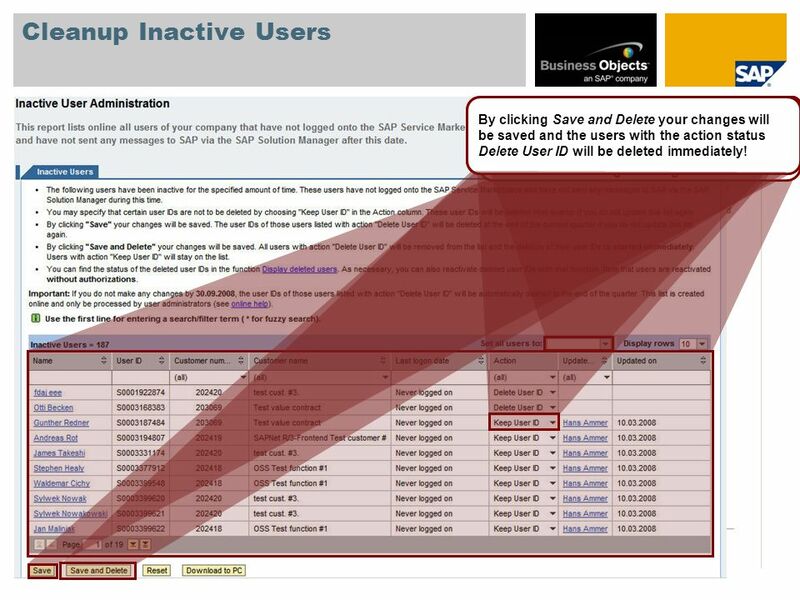 SAP assumes no responsibility for errors or omissions in this document. SAP does not warrant the accuracy or completeness of the information, text, graphics, links, or other items contained within this material. This document is provided without a warranty of any kind, either express or implied, including but not limited to the implied warranties of merchantability, fitness for a particular purpose, or non-infringement. SAP shall have no liability for damages of any kind including without limitation direct, special, indirect, or consequential damages that may result from the use of these materials. This limitation shall not apply in cases of intent or gross negligence. The statutory liability for personal injury and defective products is not affected. SAP has no control over the information that you may access through the use of hot links contained in these materials and does not endorse your use of third-party Web pages nor provide any warranty whatsoever relating to third-party Web pages Weitergabe und Vervielfältigung dieser Publikation oder von Teilen daraus sind, zu welchem Zweck und in welcher Form auch immer, ohne die ausdrückliche schriftliche Genehmigung durch SAP AG nicht gestattet. In dieser Publikation enthaltene Informationen können ohne vorherige Ankündigung geändert werden. Einige von der SAP AG und deren Vertriebspartnern vertriebene Softwareprodukte können Softwarekomponenten umfassen, die Eigentum anderer Softwarehersteller sind. SAP, R/3, xApps, xApp, SAP NetWeaver, Duet, SAP Business ByDesign, ByDesign, PartnerEdge und andere in diesem Dokument erwähnte SAP-Produkte und Services sowie die dazugehörigen Logos sind Marken oder eingetragene Marken der SAP AG in Deutschland und in mehreren anderen Ländern weltweit. Alle anderen in diesem Dokument erwähnten Namen von Produkten und Services sowie die damit verbundenen Firmenlogos sind Marken der jeweiligen Unternehmen. Die Angaben im Text sind unverbindlich und dienen lediglich zu Informationszwecken. Produkte können länderspezifische Unterschiede aufweisen. Die in diesem Dokument enthaltenen Informationen sind Eigentum von SAP. Dieses Dokument ist eine Vorabversion und unterliegt nicht Ihrer Lizenzvereinbarung oder einer anderen Vereinbarung mit SAP. Dieses Dokument enthält nur vorgesehene Strategien, Entwicklungen und Funktionen des SAP®-Produkts und ist für SAP nicht bindend, einen bestimmten Geschäftsweg, eine Produktstrategie bzw. -entwicklung einzuschlagen. SAP übernimmt keine Verantwortung für Fehler oder Auslassungen in diesen Materialien. SAP garantiert nicht die Richtigkeit oder Vollständigkeit der Informationen, Texte, Grafiken, Links oder anderer in diesen Materialien enthaltenen Elemente. Diese Publikation wird ohne jegliche Gewähr, weder ausdrücklich noch stillschweigend, bereitgestellt. Dies gilt u. a., aber nicht ausschließlich, hinsichtlich der Gewährleistung der Marktgängigkeit und der Eignung für einen bestimmten Zweck sowie für die Gewährleistung der Nichtverletzung geltenden Rechts. SAP übernimmt keine Haftung für Schäden jeglicher Art, einschließlich und ohne Einschränkung für direkte, spezielle, indirekte oder Folgeschäden im Zusammenhang mit der Verwendung dieser Unterlagen. Diese Einschränkung gilt nicht bei Vorsatz oder grober Fahrlässigkeit. Die gesetzliche Haftung bei Personenschäden oder die Produkthaftung bleibt unberührt. Die Informationen, auf die Sie möglicherweise über die in diesem Material enthaltenen Hotlinks zugreifen, unterliegen nicht dem Einfluss von SAP, und SAP unterstützt nicht die Nutzung von Internetseiten Dritter durch Sie und gibt keinerlei Gewährleistungen oder Zusagen über Internetseiten Dritter ab. Alle Rechte vorbehalten. 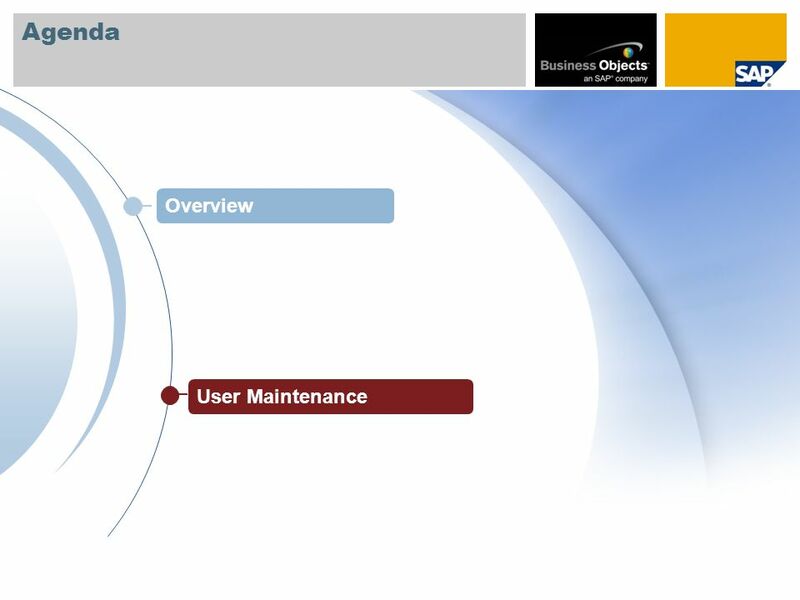 Herunterladen ppt "User Data Maintenance Learning Map SAP Support Portal."